I write a lot on this blog about discovering beautiful and enlightening aspects of my new hometown, Tacoma, WA. But today an article on NPR (National Public Radio) has prompted me to look back on the city where I lived for 42 years, St. Louis, MO. 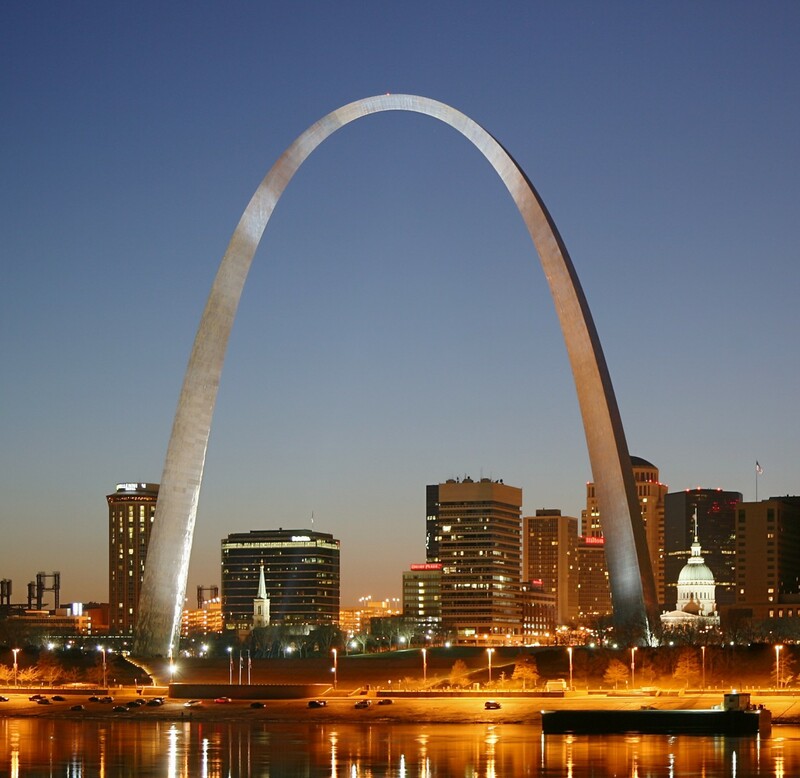 The most iconic St. Louis artifact is the gleaming Gateway Arch, a monument to westward expansion. Whenever we would return from a trip to somewhere east of St. Louis along I 70, I would look for this symbol of home. When we first moved to St. Louis, I was surprised to learn that a lot of the local people dismissed it as nothing special. This is characteristic of people everywhere: They poo-poo their distinctive landmarks as things designed solely for the amusement of tourists but beneath the consideration of the local inhabitants. But I loved the Arch, this simple yet beautiful shape, from the first moment I saw it. The stainless-steel clad Gateway Arch sits on the west bank of the Mississippi River near the site of the original settlement of St. Louis. At 630 feet (192 m) tall, it is the tallest monument in the Western Hemisphere. Construction began on the Arch on February 12, 1963, and was completed on October 28, 1965. The monument opened to the public on June 10, 1967. It is the centerpiece of the 91-acre Jefferson National Expansion Memorial, which is maintained by the National Park Service. Underneath the Arch is a museum about westward expansion. Whenever out-of-town guests came to visit us in St. Louis, we always took them to the Arch. A tram system carries visitors to the top in little cars (that seriously tested my slight claustrophobia) that hold five people. As the cars ascend, they become slightly tilted. Periodically the cars adjust with a distinctive “choonk” sound and forward movement to return to an upright position. I always prepared visitors for this, since it can be a frightening sound and sensation to anyone who isn’t expecting it. For all the wonder and appreciation St. Louis’ Gateway Arch monument inspires, some see the message and history of the Arch as divisive. the Arch was built to honor St. Louis’ role in westward expansion, a time when Manifest Destiny was used to push Native Americans and Mexicans out of their lands. The museum under the Arch is being redesigned to include that perspective. Racial inequality is another shadow some see cast by the Arch. Many residents of Kansas City, 250 miles west of St. Louis, believe that their city deserves the title of Gateway to the West. Fifty years after the Arch was built, its anniversary has inspired National Park officials to take a closer look at what the monument represents. When the museum reopens in 2017, it may be known simply as the Arch Museum instead of the Museum of Westward Expansion.